We had the pleasure of speaking to Jack Davenport, best known in America for his part in Pirates of the Caribbean, This Life, Coupling, Smash among other works. He is in the film Americana, on DVD and digital HD March 28. Here is our interview, recorded on Thursday, March 30, 2017. Here is the Jack Davenport Fan Page on Facebook. Here is Jack’s IMDb page. Jack Davenport (born 1 March 1973) is an English actor. 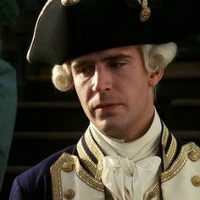 He is best known for his roles in the television series This Life and Coupling, and as James Norrington in the Pirates of the Caribbean series. He has also appeared in other Hollywood films, such as The Talented Mr. Ripley. More recently, he was part of the ensemble cast in the drama series FlashForward and Smash, and took the lead role in the 2013 ITV drama series Breathless. Davenport, the son of actors Nigel Davenport and Maria Aitken, was born in Wimbledon, London, and lived in Ibiza, Spain, for the first seven years of his life. His uncle is writer and former Conservative MP Jonathan Aitken, his maternal grandmother was socialite Penelope Aitken, his maternal grandfather was politician William Aitken, and one of his maternal great-grandfathers was John Maffey, 1st Baron Rugby. His parents divorced when he was seven, at which point he was sent to the independent Dragon School in Oxford, as his parents did not want him to become involved in the divorce proceedings. He then went on to attend Cheltenham College, followed by the British American Drama Academy. Davenport had not planned to become an actor; however, his career began when he took a gap year after attending Cheltenham College. A director from Clwyd Theatr Cymru was impressed by his performance in a summer drama course and asked Davenport to work for him. Aged 18 he was in Wales, performing bit parts in Hamlet, where he became friends with Rhys Ifans. The following year, he attended the University of East Anglia (UEA), concentrating in Film Studies and English Literature. He tried acting once more at the UEA but was not, at this point, particularly interested in it. Davenport had considered becoming a member of a film crew, as opposed to acting in front of the camera. His mother advised him, after his graduation from UEA, to write to John Cleese requesting work on the set of his upcoming film, Fierce Creatures, so that Davenport could gain some experience behind the camera. Cleese instead sent Davenport’s letter to the casting department, and he was subsequently cast as a trainee zookeeper. While a small part with few lines, it provided his first opportunity to work in front of the camera. After the production of Fierce Creatures was completed, Davenport found an agent who secured him an audition for the role of Miles Stewart in the BBC television drama series This Life. Since then Davenport has played roles in many successful films and TV series, including The Talented Mr. Ripley, Coupling and Ultraviolet, as well as the box office smash Pirates of the Caribbean: The Curse of the Black Pearl, and its sequels, Dead Man’s Chest and At World’s End. During his career Davenport has also performed voice-overs, having narrated the audio versions of John Buchan’s The Thirty-Nine Steps and recorded parts in Anthony Burgess’ A Clockwork Orange. He also provides the voice over for the British MasterCard advertisements (the American being done by Billy Crudup). In 2006, he featured in the ITV1 drama The Incredible Journey of Mary Bryant and in 2009 starred in the film The Boat That Rocked. In 2007 Davenport was cast in Swingtown, a period and relationship drama for CBS about the impact of sexual and social liberation in 1970s American suburban households, with story arcs involving open marriages and key parties. This was cancelled after one season. In 2008, Davenport was cast in the ABC pilot FlashForward, which was based on a Robert J. Sawyer novel. In the series, Davenport played the character of Lloyd Simcoe, a physicist allegedly responsible for a worldwide blackout, which causes the whole world to see the future. The series was cancelled after a single season. In February 2011, Davenport was cast in the NBC musical drama pilot Smash. The series follows a group of people coming together to put on a Marilyn Monroe musical on Broadway. Davenport plays the musical’s director. Davenport also starred as the replacement singer in the video for Snow Patrol’s single “Called Out in the Dark”, released on YouTube on 17 August 2011, alongside Tara Summers and Gary Lightbody. Inspired by the paranoid nail-biters of the ’70s and set against the foggy skies and twisty streets of San Francisco, AMERICANA is a tense thriller about facing the consequences of an ugly past. Following a festival run that included being nominated to the “New American Cinema Competition” at the 2016 Seattle International Film Festival and capturing the “Best Feature Film Award at the 2016 Lower East Side Film Festival, Zachary Shedd’s feature-length debut, called “tantalizing ” by the Moveable Fest and “a superbly confident throwback ” by Anthem Magazine will be released on March 28, 2017 to DVD ($14.99) and Digital HD courtesy of Candy Factory Films. Two years after alcoholism and depression drove Avery Wells (David Call, Two Gates of Sleep, Tiny Furniture) from his home and career, the San Francisco film editor finds himself back in the city, sobered up and coerced into finishing a cut of a new film – Americana . Avery relents and takes the job due to his connection to the film’s star — his sister Kate (Kelli Garner, Lars and the Real Girl, The Aviator ) — and the convincing of the film’s producer, Calib Andrews (Jack Davenport, Pirates of the Caribbean, Kingsmen: The Secret Service ). Like Avery, the cut is a mess, but the talented editor can salvage it, all while staying clean and reconnecting with his family. Soon, though, he starts receiving menacing calls from a stranger threatening to reveal his darkest secrets – threats impossible to ignore when his sister is murdered. Grief and shame set in as Avery’s suspicion of conspiracy grows and he falls off the wagon. Was her death related to the new film? Or was she killed because of mistakes made in the past? As Avery’s abusive behavior continues, he dips deeper into paranoia- spurred on by his lawyer Ben (Peter Coyote, Erin Brockovich ) and brother-in-law Josh (Frank Mosley, Upstream Color ) – and only more questions are raised.